Whilst doing an interview for my family tree research I was told about a relative of mine who was murdered in the 1950s or 1960s. 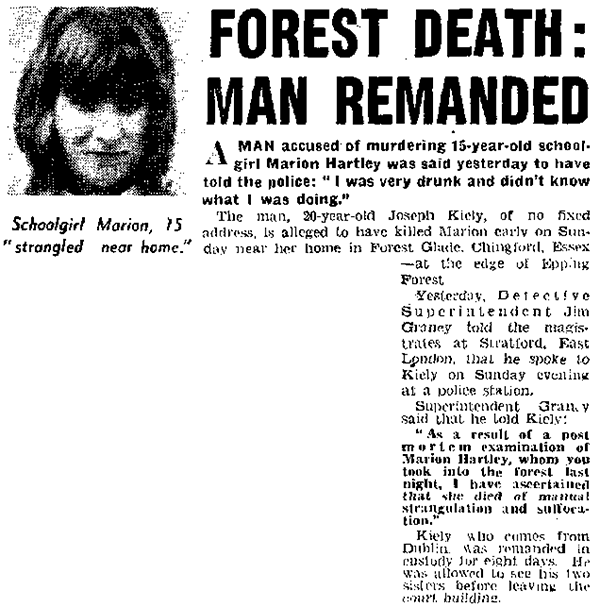 This page documents what I’ve found, and have been told, about Marian Hartley, a 15-year-old schoolgirl who was killed by Joseph Kiely in Walthamstow in 1966. If you’ve got anything to add, or disagree with what I’ve included below, please leave a comment at the bottom, after the tabbed content. Marian Hartley was born 16th February 1951 at North Middlesex Hospital, Pymmes Park, Middlesex and was the daughter of Eric and Maud (née Faulkner) Hartley. She had three siblings: Barbara, Derek and Sandra. Had she been alive today, she would be my first cousin twice removed – she was my nan’s cousin, Marian’s grandmother is my great great grandmother. Squads of police searched the fringe of a forest yesterday after a blonde schoolgirl has been attacked and killed. The schoolgirl, 15-year-old Marion Hartley was attacked as she walked home from a dance at Chingford, Essex, after midnight. Sounds of a struggle were heard by some of her neighbours in Forest Glade – a dim lit road with houses on one side and the edge of Epping Forest on the other. Soon afterwards, 250 police with dogs began searching the forest. Marion, a fourth-form pupil at Walthamstow High School was found dead in a bramble-patch, less than 100 yards from her home. The police kept searching. Several men seen in the area were questioned. As daybreak came, anglers began arriving to fish in a pond near where the dead girl had been found. They were turned away. After five hours, the search was called off. Last night, a 20-year-old man was charged with murder. He will appear in court at Walthamstow today. The article doesn’t mention the cause of her death, although my initial source said that she may have been strangled and that the person charged with murder may have been her boyfriend at the time. They also said they thought she had just got off a bus, but that seems to contradict the article. The man, 20-year-old Joseph Kiely, of no fixed address, is alleged to have killed Marion early on Sunday near her home in Forest Glade, Chingford, Essex – at the end of Epping Forest. Yesterday, Detective Superintendent Jim Graney told the magistrates at Stratford, East London, that he spoke to Kiely on Sunday evening at a police station. Kiely, who comes from Dublin, was remanded in custody for eight days. He was allowed to see his two sisters before leaving the court building. I was 11 when Marion died. Her father, who I only knew as Mr Hartley, had a shop in either Orford Road, Walthamstow or one of the adjoining roads. His shop, if my memory serves me well, was an electrical shop that sold televisions and radios. I seem to remember a white sign over the shop that said Hartleys and I think Mr Hartley did repairs. He was (to me) a tall thin man with white hair. I don’t remember seeing his wife. My mum was quite friendly with the family and was often in the shop. All I remember from the time of her death were the conversations in our house at the time. It was the most shocking thing and actually is different from the above news story. Mum said that she had gone to a school dance and that there had been a bit of an argument between Marion and her parents, they had wanted to pick her up after the dance and she had showed off, saying that she was old enough to come home by herself, they had in the end relented. The other thing where it differs is that my parents were saying she had been found hanged from a tree. Quite obviously her parents were devastated. I particularly remember this time because a short time afterwards Mr Hartley gave my mum Marion’s clothes, school blazer etc. I refused point blank to wear them and my mum eventually threw them away – I remember the shop being closed for a while but I have the impression that he then reopened and was working in there but I don’t remember how long for. I’m not sure if she was actually hanging or ‘suspended’, sort of hooked into the tree, if you can understand that, but as I said, it was conversations around the event so may be misleading, but it still is something my mum was always adamant about. I do have a little more background information for you, although sadly not in relation to her death. We live in Chingford now, my husband has always lived in Chingford. He had a paper round with Marian, together they were employed by Bill Lands newsagents in Hatch Lane, Chingford. My husband was around 14yrs old at the time and used to be at the house in Forest Glade often with Marion and fondly remembers picking gooseberries with her in the garden and ‘hanging out’ together with her at Highams Park boating lake. He said her character was very bubbly and she was always laughing and happily playing around and that her character was very much of a tomboy, and he remembers she usually wore shorts and t-shirts in the summer. There’s an article by Matthew Spicer regarding the murder of Marian Hartley. A photocopy of it was given to my aunt to read because the murderer Joseph Kiely, is from Tipperary Town. He lived across the road from her when they were young. Its 3 pages long with pictures of the incident – her jacket, shoes, Joseph and where it happened etc. There’s also a picture of a letter she wrote to the Walthamstow and Waltham Forest Guardian on the Saturday before it happened. They received it on the Monday morning the story broke. She was collecting Green Shield Stamps to buy a minibus for her school. She hoped the newspaper would help by promoting it. I’ve since got a copy of the magazine Laura refers to, so will uploads more details here when possible. I’ve spoken to Matthew Spicer, and he confirms that the images and details come from the open court report. Joseph A. Kiely apparently grew up in Tipperary, but later had moved to Dublin, before coming over to the UK in early July 1966. An Irishman seized a schoolgirl, aged 15, pulled her into Epping Forest and strangled her, it was alleged at Stratford Magistrates Court, E., yesterday. 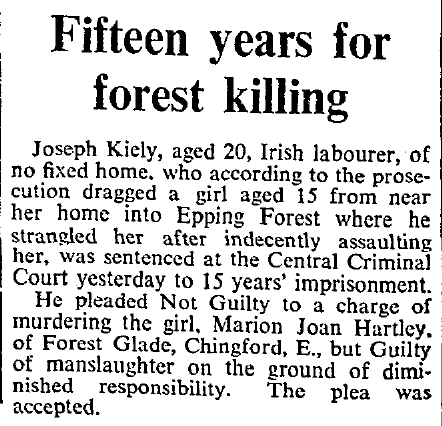 Joseph Kiely, aged 20, unemployed, of no fixed address, appeared on a charge of murdering Marion Joan Hartley, of Forest Glade, Walthamstow, E.
Kiely was said to have told the police that he was frightened. Later he went back to have a look, but the police were there, and he went away. 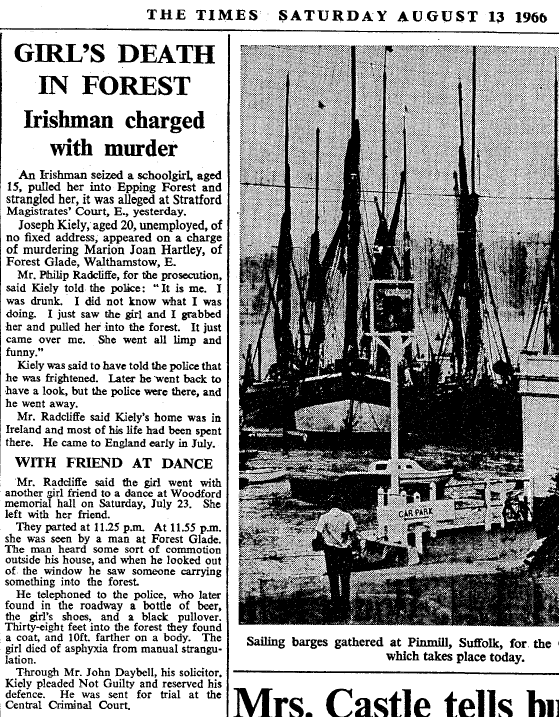 Mr. Radcliffe said Kiely’s home was in Ireland and most of his life had been spent there. He came to England early in July. Mr. Radcliffe said the girl went with another girl friend to a dance at Woodford memorial hall on Saturday, July 23. She left with her friend. They parted at 11.25 p.m. At 11.55 p.m. she was seen by a man at Forest Glade. The man heard some sort of commotion outside his house and when he looked out of the window he saw someone carrying something into the forest. He telephoned to the police, who later found in the roadway a bottle of beer, the girl’s shoes, and a black pullover. Thirty-eight feet into the forest they found a coat, and 10ft. farther on a body. The girl died of asphyxia from manual strangulation. Through Mr. John Daybell, his solicitor, Kiely pleaded Not Guilty and reserved his defence. He was sent for trial at the Central Criminal Court. Joseph Kiely, aged 20, Irish labourer, of no fixed home, who according to the prosecution dragged a girl aged 15 from near her home into Epping Forest where he strangled her after indecently assaulting her, was sentenced at the Central Criminal Court yesterday to 15 years’ imprisonment. He pleaded Not Guilt to a charge of murdering the girl, Marion Joan Hartley, of Forest Glade, Chingford, E., but Guilty of manslaughter on the ground of diminished responsibility. The plea was accepted. The National Archives appear to have two records for Kiely – one record covering the dismissed charge of murder, and one closed record covering the eventual charge of manslaughter. I’ve asked for an estimated cost to send me all of the first record, and put in a Freedom of Information request on the second one, although I’m not expecting the record to be opened. http://www.britishmurders.co.uk/murder-content.php?key=8275 also references Kiely’s conviction. Someone left an anonymous comment that said that the killing was mentioned in Series 1 Episode 6 of Till Death Us Do Part. This was a British comedy that started in the 1960s. The episode got wiped by the BBC as per their policy at the time, but there is an audio-only version available somewhere, though I don’t think Series 1 Episode 6 is a correct reference. Unfortunately, this episode was supposedly broadcast on the 18th July 1966, several days before Marian’s death. No other murders are of young females are known to have occurred during this time, so either the recorded date of broadcast is wrong, or it does indeed reference Marian’s death. Hi, i have just burried my grandfather. Marion is my great aunt. We have found all the newspaper clippings and im interested in finding out anymore information. There is indeed a mention of a naked murdered girl at Epping (listen to the first minute of https://www.youtube.com/watch?v=pS7AGUfTfJM). This episode was broadcast the day after Marian was Killed, and the day on which it was first reported in the national papers. I know the show was recorded in front of a live audience, but it might also have been recorded on the day it was broadcast, or even done completely live – in which case, the timings are too coincidental for it not be a reference to Marian. Thanks for the fascinating lead! I remember, in my childhood, becoming aware that a Joe Kiely had returned to live in my neighbourhood in Tipperary Town, Ireland. It wasnt what one might consider a disadvantaged area. At that time it was similar to many other working class areas both in Britain and in Ireland. It was populated, in the main, by decent hard-working people most of whom had brothers and sisters working and rearing their own families in England. Rumours abounded that the same Joe Kiely had been released from a British prison but, with no internet and little newspaper coverage we, the younger ones, were never too sure of his crime, its nature or his sentence. Im sure our parents were better informed. We were always just told to keep our distance from Kiely. One day, when I was older and while out hunting, I happened across a deserted farmhouse. Looking around inside I came across an old and yellowing newspaper which described Marians murder at the hands of Kiely and his conviction and sentence. People in our neighbourhood always kept their distance from him and, even though he lived less than 60 yards from my house, I never looked at or acknowledged him. I was aware that he was an above-average artist and that he spent most of his time indoors. Not many publicans in the town would allow him onto their premises. Actually, an unusual anecdote: When, in my mid-twenties I called into a respectable local pub I was surprised to see Kiely drinking alone at the bar. I ignored him when he attempted conversation. When I had an opportunity I beckoned the young barman, who had no idea whom he was serving. I told him to tell the owner that he had a very unwelcome patron on the premises. The owner, a hulk of a man, was soon on the scene. He took one look at Kiely, uttered not a word, but in one smooth move, he lifted him by the throat, hauled him out the front door and deposited him in the gutter. A most appropriate place for this individual. Im sure it must add further insult to the already awful injury suffered by the families of the deceased when they see convicted killers released early from prison. If it is of any small comfort I can honestly state that Kiely has always been, and will remain, a social pariah. He has a nothing life, no friends and hopefully he will forever suffer the consequences of his actions. May Marians soul rest in eternal peace. I really like what you have written. Marion was my great aunt. Im learning all about her murder after finding clippings in my grandfathers home. So many years later, and I still remember Marian. I was 6 when she died and lived in Forest Glade about 100 yards from where she so sadly lost her life. I believe she was found by or hanging from a tree. This tree was popular with all the kids that lived in Forest Glade, it had a low hanging branch from which a rope or a swing was attached. We all used to play there often with Marian. My fondest memory of Marian was when she came home from school on her bike, she would often let me sit on the handlebars and cycle up and down the road. After her death, the kids in Forest Glade did not run free in the forest as we used to, our parents would not allow it. Several families, including mine moved shortly afterwards but her memory lives on. Hi, Maud Hartley was my great Auntie, I used to see her and Uncle Eric at my Nan and Grandads house in New Southgate , and sometimes we used to over to Forest Glade ,where I always coveted Uncle Eric’s valve radio in the front room !. It wasn’t until I was a teenager that I knew about their sadness and the tragedy of poor Marian .I am 52 now. Hi, I am Andy’s Auntie and Marian was my cousin. We spent a lot of time together as she was only a month younger than me. Our families used to go to Jaywick, near Clacton, on holiday along with Marian’s sister Sandra. Our families used to visit each other regularly and after Uncle Eric died Aunty Maud and my mum Mary visited each other every two weeks right up until Aunty Maud died. We also visited another Sister Barbara and her family in Welwyn Garden City. Brother Derek I met but only a couple of times as he lived in Australia. It was such a sad time when Marian died, I remember hearing about it on a Sunday evening after a cricket match. As I was too young to go into the pub with Mum & Dad and the team, me and another child were sitting in the coach (in those days not everyone had cars !!!!!!) with another girl, the coach driver had left the radio on when it came over the radio. As you can see I will never forget it. Marian would have been 64 now. I remember Marian well. We lived at 46 Forest Glade. My sister was a little younger than Marion at the time and I, younger still, being nine. Thankfully I remember the good times we had as children playing in the forest. Tobogganing on the hill by the lake, the winters when there was enough snow and swimming in the local pools. Marian was like an older sister to us in many ways. Her death was a terrible shock to everyone who lived in the area and quite a few families moved away during the years that followed. Marian bred guineapigs and we helped look after them during the time immediately after her death. My family lived at 74 Forest Glade from 1952 until 1975. My mother told me that there was a party, hosted by a neighbouring teen, behind our house on Sheridan Road. Kiely had been drinking in HIghams Park that night, wandered up Castle Avenue and tried to crash the party. He was turned away, but hung around. Sadly, the girl came by, returning from the Youth Club at Sidney Burnell School. A neighbour living at either number 66 or 68, heard a girl screaming, looked out and saw her being dragged into the forest. Unbelievably, they called the police, but did nothing further to help. My parents were wakened by voices at about 2 am and saw policemen in the street and lights in the forest. Marian’s body had been found and the forest was surrounded until Kiely emerged around dawn. I was at Selwyn Avenue Girls’ Primary School with Marian. We were in the same class until we left to go to secondary school. She was a quiet and clever girl and we all liked her. I presume she went on to Walthamstow High School because I don’t think she went to Tech and she didn’t come to Woodford CHS. Hi Gary ,I am maud and Eric’s granddaughter ! Marian did go to Walthamstow High School for Girls and all the staff and pupils there were devastated by her death. As teenage girls, we had always been allowed to walk around freely as it was considered a safe area. I am 65 now and met up with my classmates recently and we talked about Marian, We haven’t forgotten either and i would like to send our condolences to her family. I,too, was in the same class as Marion at Walthamstow High School. I lived in Chingford and remember hearing on the Sunday evening that a young girl had been killed. It was not until the next day, or possibly the day after, that her name was released. I will always recall the shock of realising it was not just “a girl” but somebody I knew well. This was during the first week or so of our Summer Holiday following the fourth year (now Yr10). I am sure that all of our form, 5H, will remember the pathos of returning to school in September and our new form tutor, Mrs Allason, beginning the day by talking about Marion, saying that we should “remember the good times with her, the fun and the laughter” Such a sad time.